James Langworthy had been mining lead north of Galena, Illinois for nearly five years when he decided in 1829 to seek greener pastures west of the Mississippi River. A lot of miners were working claims near that famous "lead rush" town, and there was always talk of the possibilities that lay yet untapped in the Indian territory President Jefferson bought over two decades earlier. Surely there must be some potential left in Julien Dubuque's old claim, for the Indians living there keep bringing ore to smelt and trade. Arriving in the Meskwaki village at the mouth of Catfish Creek, Langworthy and a handful of other miners secured permission to explore Dubuque's old Mines of Spain claim. “Through it runs a coulee from the Little Maquoketa all the way to the Great River. The coulee is a fine level prairie surrounded by bluffs and forests, and interrupted here and there by hollows with more bluffs, and more forests, and springs. 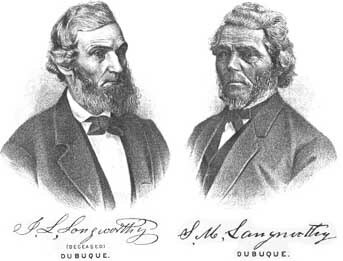 Copies of lithographic portraits of James L., and Solon M.Langworthy, two of the important Langworthy brothers of early Dubuque. Originally published in Chandler W. Childs’ History of Dubuque County, Iowa, 1880. That description of what we now call the Couler Valley and nearby Union Park Hollow, just north of the present limits of Dubuque, fits the 160 acre claim of Dr. Stephen Langworthy to a tee. By the time he arrived in Dubuque, Dr. Langworthy’s eldest sons, James, Lucius, and Edward, were living on their own and had already made names for themselves in the establishment of Dubuque as a city. Unlike his adventuresome sons, Stephen waited until after the government had finally seen fit to permit mining west of the Mississippi in the recently negotiated Black Hawk Purchase. Exactly when Dr. Langworthy arrived in Dubuque is uncertain, but he established his household in time to participate in Dubuque’s Independence Day celebration of 1836, serving as “President of the Day.” Census takers in 1840 noted that Dr. Langworthy’s household included nine people, including two engaged in mining, three in agriculture, one in manufacturing or trade, and one learned professional or engineer. The government’s General Land Office survey of the newly formed Iowa Territory reached Dubuque in the fall of 1837. The surveyors found that Dr. Langworthy had settled north of the thriving town, and they recorded his claim as the NW¼ of Section 11, T89N-R2E. The surveyors also noted that Dr. Langworthy had built a house on his claim. But for reasons lost to history, the surveyors did not record the bearing and distance of Dr. Langworthy’s house from the nearest corner post, as they had for other Dubuque area miners and settlers. Perhaps the land was too rough, the distance too far. It would be nearly 30 years before civil engineer and map maker T. H. Thompson printed what may be the first commercially published plat map of Dubuque County land ownership, and by then the land had passed out of the Langworthy family name. Like so many other territorial period houses in Iowa, the exact location of Stephen Langworthy’s 1830s house was never mapped. Was it a log house? Probably, but how big was it? For a family of nine it must have had several rooms, perhaps even two stories, and even an outbuilding or two. The doctor and his family left no description of their first Iowa home. Legal title to much of the property in the Dubuque area was in question throughout much of the territorial period because the heirs of Pierre Chouteau, successor to Julien Dubuque, claimed ownership of the old Mines of Spain grant. The battle over Chouteau’s heirs’ rights to the Dubuque lands raged for years and wasn’t settled until an 1847 ruling of the U.S. Supreme Court. Dubuque settlers were not allowed to enter their claims in county records until the Chouteau case was resolved. When he was finally able to enter his Dubuque claim, Dr. Langworthy probably was getting on in years, and apparently felt it best to include his son William as co-owner of the claim. William may have been the eldest son still living with his father at the time. Dr. Langworthy may also have been planning for future use of his property by his offspring after his death. By the late 1840s the original house was over 10 years old, and it was time for some major improvements. Dubuque had no brickmaker in the mid-1830s, but with the success of the local lead mining industry and the rapidly growing population, the construction industry and related trades also grew. By the 1840s, local brickmakers, for example, could supply construction brick that previously had to be shipped in from sources east of the Mississippi. Sometime in the late 1840s Dr. Langworthy replaced or extensively remodeled his original Dubuque house. But once again, first hand accounts of the timing and circumstances surrounding the Langworthy family’s decision to reconstruct their dwelling escape us. What we do know is that much of the NW¼ of Section 11, T89N-R2E continued to be owned by Stephen Langworthy’s offspring until 1862, when transfer records show that the property passed out of the Langworthy family ownership. The importance of the Langworthy family in Dubuque history was never forgotten. James, Lucius, Edward, and Solon Langworthy each contributed to the development of Dubuque. Their influence also reached well beyond Dubuque when they helped build the military road from Dubuque to Iowa City. The towns of Solon and Langworthy along the route commemorate this achievement. But after 150 years, records of the family patriarch’s tenure in Dubuque are scarce, and memories of Dr. Stephen Langworthy have faded. What was his life like in his senior years? Was he able to afford quality goods for use in his household? Answers to questions like these can only be found in the archaeological record at his homestead.